As data centers virtualize across private, public, and hybrid cloud, data center security is increasingly challenging as threat environments gain sophistication. Not only is customer data protection critical to compliance with regulations like PCI DSS, but data center security must reduce risk and maintain cost effectiveness while enabling a superior user experience. To provide the security necessary for PCI compliance, a variety of security tools must be deployed and security processes and procedures implemented. 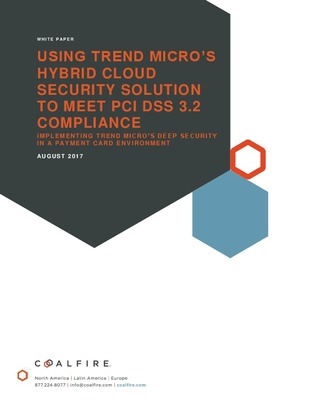 This white paper examines the applicability of Trend Micro’s Hybrid Cloud Security Solution, specifically Trend Micro Deep Security, to secure Payment Card Industry data in accordance with the PCI DSS when used in physical, virtual, cloud, or container environments.